We manufacture trawl and mooring winches used to pull the fishing net, anchor or and any other heavy load. Extremely heavy duty and top class products. Once it's fitted, no need for any maintenance for several years. Very tough and strong design. Users vote our trawl winch as the no.1 winch for trawling type of fishing. - Effectively pull smaller boats and other heavy loads without the help of extension cords or engines. - Extensive demand in marine industry. GMP Heavy Duty Twin Drum Winch: Available in Standard, Medium and Jumbo sizes with gearbox ratio of 27:1 or 32:1. Our Heavy Duty Twin Drum winches are designed for marine applications and support various loads and winding capacity as required by customer. The company shares glorious credentials with the renowned Suppliers of Marine Mooring Winches from Gujarat. 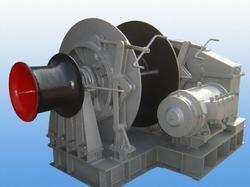 We make available different types of Marine Mooring Winches for electric and hydraulic power. 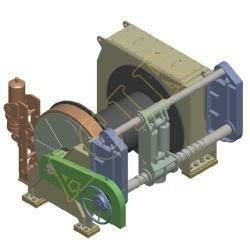 The delivery program of the industry winches covers the more common general purpose winches like worm gear, planetary, slew ring and traction winches. The specified winch types are indications of possibilities. The majority of the EMCE winches are tailor made and are appropriate to your specific application. Meghna Metallurgical & Marine Works Pvt. Ltd.
We offer an extensive range of Planetary Winches, which is well-known for its rugged design to suit outside weather condition. Our range is made using high grade raw materials in compliance with industry standards, which is available at industry leading prices. Moreover, our clients can avail at industry leading prices.